In the event of a disaster or crisis, most often families tend to be separated from each other with a fragment ending up in a wilderness setting or some environment with little or no modern facilities. 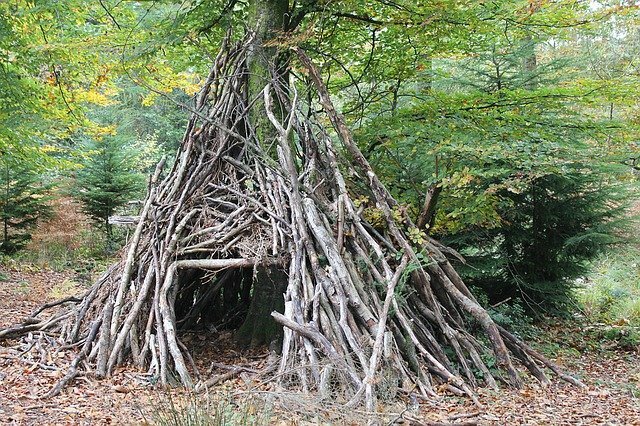 Having an idea on how to establish a simple shelter, would enhance your chances of survival if you are stranded in the wilderness without the possibility of helping coming soonest. Rather than venturing deeper into the wilderness, it’s best you stay put and wait for help to arrive. If you have a GPS device or map you can proceed to track your way out, else it’s best you let others track you down. This is an essential commodity when trapped in the wilderness. This is because, without a bed, you will find it difficult to rest. This can result in the stiffness of the neck and back aches, especially for those who aren’t used to relaxing or sleeping without a bed. Constructing a bed is pretty essential to survive in the wilderness. For those living in Canada or the United States, you are likely to find a significant amount of balsam trees in around your surrounding environment. A balsam bed is soft, springy, and comfortable because it is made up of leaves and young, pliant twigs. When you are on the move in search of materials from a balsam tree, endeavor to pick sets of long twigs of about 18+ inches long and short twigs between 10-12 inches long. Place the longer balsam twigs on the ground as it would serve as a foundation for your bed, while the longer ones should be placed on top to serve as the cushioning material. Fashion your bed until the top layer has an adequate amount of cushioning. This will perfecting act as a substitute for your bed. If you have a blanket or any other types of bedding, place it over your improvised bed to protect your clothes from sticking to the sap. The sap that emits from the balsam tree is usually sticky and after a couple of minutes. Though it can be washed off with hand soap or detergents, a small quantity of animal fat or vegetable oil will be needed to soften it and slide it off your cloth or skin. Can half-caves be used as a shelter? Since time immemorial, half-caves have always been used as shelters. Half-caves are roomy depressions usually found at the bottom of valleys and cliffs. These half-caves are often durable enough to be used as a temporary dwelling place. Long before the arrival of the Columbians, Native Americans have been making use of half-caves as the centerpiece of camps. Half-craves is most often formed when the soil surface is washed away by rain and the continuous washing away of plant trees. 1. Inspect –Carefully analyze the half-cave before using it. Be cautious of rodents, snakes and small animals. Once you come across scorpions as well as other dangerous mammals, kindly retrace your steps and seek for some other shelter as their presence is a clear indication of how dangerous and risky the shelter might be. 2. Clean –If the shelter has no natural habitats clean thoroughly it by getting rid of stones twigs and excess soil to level out the ground. This will create more space inside the half-cave. 3. Keep the Rain Out –You can devise a means to shield yourself from rain, sun and other natural elements that could be of health detriment to you. Point the leaves, twigs, and branches downward to ensure that raindrops do slide to the ground and not inside the shelter.